programs are basically written in any editor. a simple notepad or an advanced Integrated Development Environment (IDE). We call the code you write source code. A good IDE is usually as important for the programmer as good quality tools are for a mechanic. An IDE will assist the programmer while he or she writes code by pinpointing spelling errors and wrong syntax. Source code is written in a synteax defined by the programming languages. You can split programming languages into two different kinds: those who need to be compiled and those who needs an interpreter. The interpreter need to interptret the code every time you run the code. Many students thinks that programs are written from the first line to the last. Luckily that is not the truth! 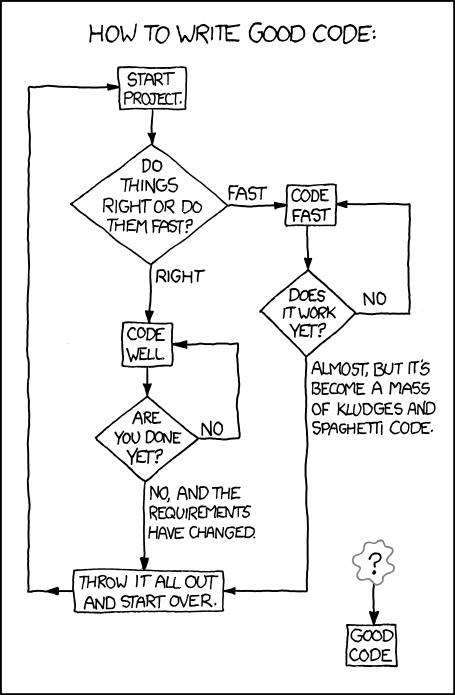 Programming is much more like small patches put together at the end. I would write something I think will be needed and then elaborate a bit on that, then realizing that som of the code Iwrote were unnecessary and another part of the code was just plain wrong! Then Imight add another tiny part and make it work together with the first part. Coding is a mess unless the programmer is very experienced in that particular domain he is programming in. First of all: There is now correct way to write a program! Divide and Conquer! It can be very complicated to write programs. Try to isolate the problems and solve them one by one. Trial and error - Run you code often and try to run it as soon as possible.